eLogicLearning is a learning management system for medium to large sized organizations and companies. The LMS, branded as eSSential LMS, helps the HR departments of the organizations to manage the learning programs in the companies and also track and monitor their effectiveness. The comprehensive Learning Management System enables the HR personnel to create and organize learning programs and events with lesser effort. With eSSential LMS, HR managers can categorize the users into different groups according to their departments, roles, and positions and provide them with the role based access to the learning material. An interactive dashboard allows the managers to assign, track, and monitor the performance of learning programs. The eSSential LMS is highly customizable and managers can personalize it down to the user-level according to the requirements. Each user has a portal where he can log in to get access to the required learning material. Managers can also customize the features of the LMS to make it adapt to the learning and training culture of their organization. The solution provides managers with a highly customizable dashboard for the managers where they can perform tasks such as creation of groups, putting the users into different groups according to their roles, assigning them with the learning material, managing the course catalogs, setting goals for the learning sessions, tracking and monitoring the history of the users, and generating reports on the performances and results of the learning programs. 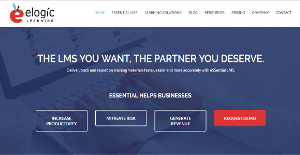 eSSential not only enables the HR managers to arrange perfect learning programs but also provides the learners with the required tools and interfaces to get the best out of the programs arranged for them. The program has features such as Single Sign-On and personal dashboards and interfaces to help the learners in getting seamless access to the learning content. Moreover, the learners can access the learning content from any type of devices they use, such as desktop, phone, tablet, or a laptop. Every business is different, and may call for a particular type of Corporate LMS Software solution that will be fit for their business size, type of customers and staff and even individual niche they support. We advise you don't count on locating a perfect app that will work for each business no matter what their background is. It may be a good idea to read a few eLogic Learning reviews first and even then you should remember what the service is supposed to do for your business and your workers. Do you need a simple and straightforward solution with only elementary features? Will you really use the advanced tools needed by pros and large enterprises? Are there any particular features that are especially useful for the industry you operate in? If you ask yourself these questions it is going to be much easier to get a trustworthy solution that will fit your budget. How Much Does eLogic Learning Cost? We realize that when you make a decision to buy Corporate LMS Software it’s important not only to see how experts evaluate it in their reviews, but also to find out if the real people and companies that buy it are actually satisfied with the product. That’s why we’ve created our behavior-based Customer Satisfaction Algorithm™ that gathers customer reviews, comments and eLogic Learning reviews across a wide range of social media sites. The data is then presented in an easy to digest form showing how many people had positive and negative experience with eLogic Learning. With that information at hand you should be equipped to make an informed buying decision that you won’t regret. What are eLogic Learning pricing details? What integrations are available for eLogic Learning? If you need more information about eLogic Learning or you simply have a question let us know what you need and we’ll forward your request directly to the vendor.